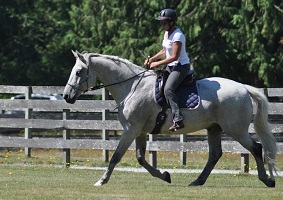 The term "Dressage" often causes honest students of the horse to shy away from a path of learning which can be fun. "Dressage" simply means the harmonious training of the horse to develop strength, balance and grace and to BE happy doing it. The hard part for the human learner is to be able to call upon those beautiful natural movements one sees when the horse is at liberty exuding free will and exuberance. The true horseman can do this without force, manipulation and intimidation and not succumb to peer pressure, competition, fear of failure or discouragement. So....here we are at the grass roots. BUT! We are already leaps ahead because we are students of Natural Horsemanship and WE have heart and desire to do this from the horse's point of view and WE will have fun doing it without confusing our partner too much! Then I stopped! That was me 25 years ago! I did some math. I figured that over a ten year span I had invested over enough money to have put a healthy down payment on a magnificent farm somewhere. And what did I have to show for it? Yes, a big box of dusty ribbons , some trophy's which could have been found in the thrift and blankets which have never been used because they were sooooo precious! Was my poor horse given any thanks for this? I suppose the journey though, boosted me forward to search for something else. Many thanks to Pat Parelli, Ray Hunt, Buck Branneman,Tom Dorrance and the Natural Horsemanship movement and to discovering Karen Rholf when she was Parelli's Dressage professionals. 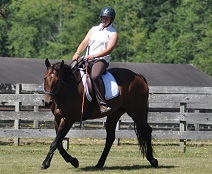 From there,I never looked back and have spent the last 20 years helping troubled horses and confused humans. I am looking forward to the next 20 years, rickety as I may become. So , my advice to my young ones is going to be , pull off your saddles , kids, and wear your craziest onesies, dressage is about to rock! 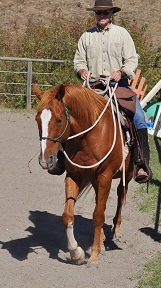 We invite you to come to the ranch to see how classical principles of dressage can be incorporated into Natural Horsemanship with amazing results. Forward, calm and collected in Mother Nature's arena. Janice and Astron. Meet Sienna, Janice’s latest partner. IS happy now! My beauty girl, my partner!